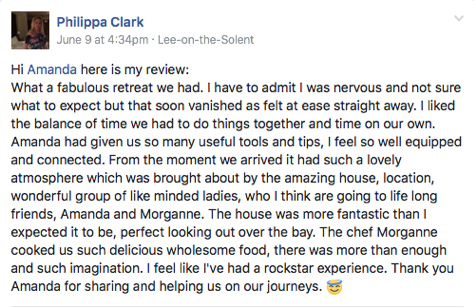 My Spiritual Retreats are one of my favourite parts of my work they are so incredibly special, indulgent and see the most amazing transformation take place in such a short amount of time. Truly life changing. 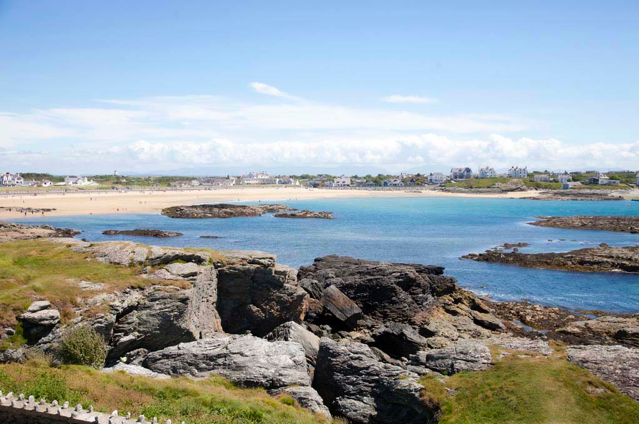 The energy is incredible in that stunning house in Anglesey where I run my Angels in Anglesey 5 Star Retreats and they get more special each time they come round. 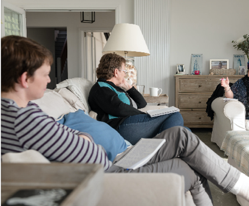 We spend our time on the retreats getting clear on what we in all areas of our lives. It’s the ultimate self care. 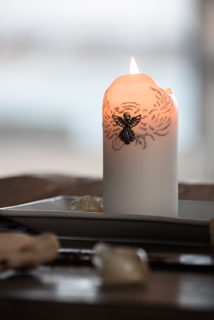 We deepen your connections with yourself, your Angels and your Guides. We journal, reflected, expand ourselves to go to the next level in our lives. We have even been known to dance! It is so much fun. 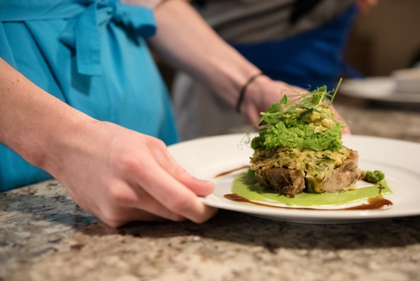 We have the most amazing food with our own private chef. Time for ourselves to enjoy the incredible surrounding, great company, music, fun and lots of laughter. We even had a little dinner party with a fabulous manifesting game too! Sounds good doesn’t it. 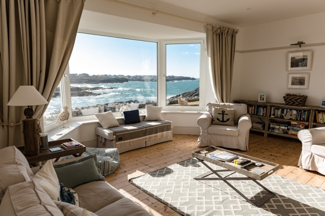 Time for you to really work on yourself in the most amazing house with breath taking views. You will leave this luxurious house floating home after being in a bubble of Angels for the 3 days. 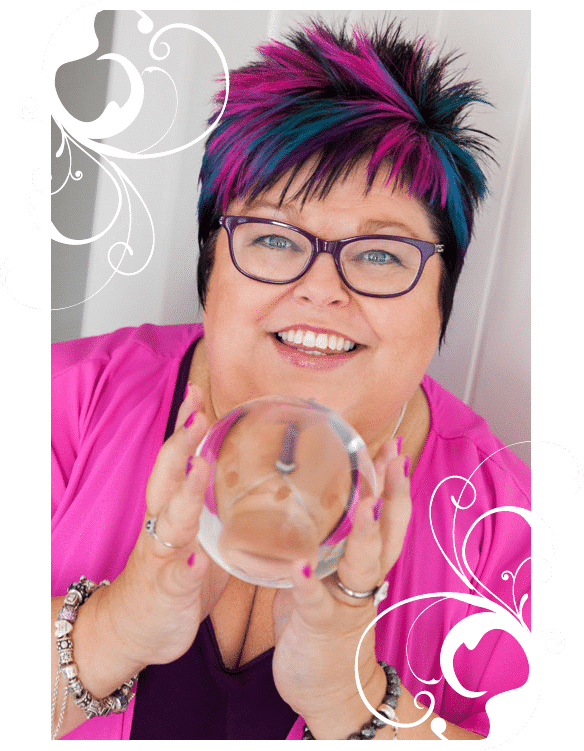 You will have new manifesting routines and deeper spiritual connections and have really indulged in some fabulous self care. In this blissful 5-star retreat you will have your own bedroom (or you can share and bring a friend to keep the cost down). This is an intimate retreat of just 6 to 8 (depending if you bring a friend). All food and drinks are included, in fact the only thing you need to bring is yourself, or a bottle of your favourite tipple if you want to drink. I will be sharing things I only share on retreat, really sharing my spiritual and manifesting practice with you. I honestly can’t tell you the agenda as that never arrives till right before but I suspect there will be lots of releasing all that is holding you back. Giving you the healing and clarity you need. I can assure you though you will be going deeper with your connections and gaining clarity with your manifesting. Arrival is 5 pm onwards, with a welcome dinner and getting to know each other evening. Departure is after breakfast on the final morning. It is all about working on yourself, discovering what you want, aligning your energy and connecting with source energy. We will be doing exercises, meditations, journaling and fun things to bring out your dreams. 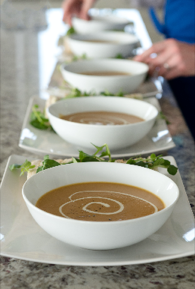 Plus, fabulous dinners, delicious breakfast each day, yummy cold lunches and snacks throughout the day. For prices, dates, availability and full details please send me an email. Payment plans are available. Also available are one and two day (with overnight stay) one to one intensive retreats. These are available in a location of your choice. For when you want all the indulgence but want to fast track with your development. P.S. 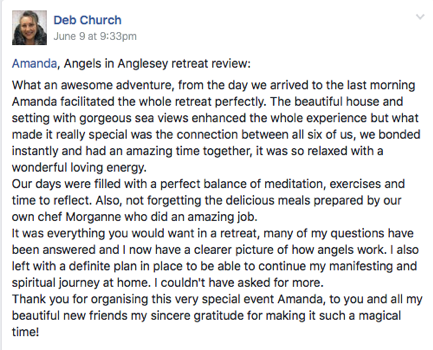 Check out the testimonials from the first one…..
Every time I have started to write how much the Angels in Anglesey retreat meant to me I just couldn’t seem to do it justice. 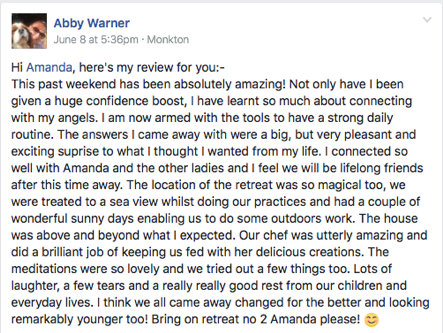 I feel so happy to have spent this time working with you Amanda and the wonderful ladies who were also on this retreat. Ladies I salute you. You are all amazing! Amanda, your retreat enabled me to get to the heart of what I really wanted to manifest. Your “Pokey stick” questions allowed us all to start to see our bigger picture. A blend of working on ourselves connecting with” the upstairs” and having the time to reflect,and release anything holding us back that didn’t serve us anymore was good for body and soul. I personally enjoyed getting my daily practices in place properly and having time to meditate. The support and encouragement from yourself and the other ladies who took this retreat was a real blessing. The retreat was such a special experience. Such peace and tranquillity in itself was so beneficial. The house and location is fantastic. The incredible food was so delicious. This was my second time attending Angels in Anglesey and once again it has been incredible. I wanted to go on the retreat to take some ‘time out’ for me, for reflection and clarity with my business. You provide and hold a ‘safe space’ to work deeply on yourself. Being with a wonderful group of amazing women find and realising their clarity was a privilege to witness. We couldn’t have done it without you Amanda, preparing this safe, special haven to do this inner work. 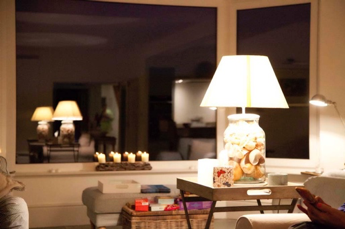 Living in a wonderful, special house in a beautiful location overlooking the sea is so special. With the added luxury of having delicious meals prepared and no washing up!! Taking this ‘time out’ to work deeply on myself has also impacted on the way I work in my business. Stepping up and taking ownership of who I am. I think the word ‘epic’ is often over-used and best reserved for things that are really deserving of it but for this retreat, it doesn’t seem enough. As a freelancer, it’s a big decision to take time out of the business but that quality time to focus on me led to some amazing insight, ideas and absolute clarity which were more than I could ever have imagined. 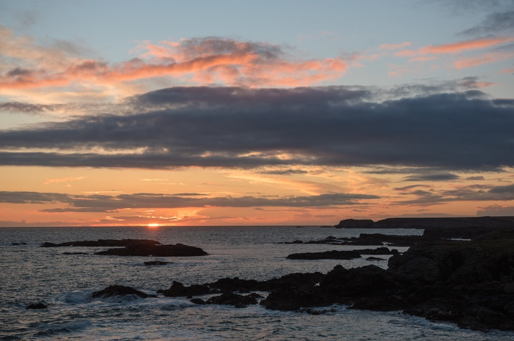 Not to mention the joy of living a life of luxury in the most beautiful house, in a stunning location surrounded by the most magical scenery and enjoying incredible food, without lifting a finger! Oh, the food; nothing has tasted as good since! And it was such a pleasure to meet and spend time with other super strong and lovely ladies – friends for life. Thank you for creating an atmosphere that felt safe to delve deep, open up and be truly honest. Thank you for being you and for being so generous with your gift; you struck just the right balance of fun, listening and tough love. Yes, I’m grateful for the pokey stick too!